The book begins with a thought about health and not disease. The reason behind this positive beginning is the highly motivated author who wishes to spread the message of health based on the ancient wisdom of great sages. With a thoroughly analytic approach almost all diseases their symptoms and cures are explained. To aid the understanding of problems from the astrological point of view examples based on actual birth charts of people are also given. This book describes in detail not only the significance of signs planets and houses but also all the twenty seven constellations. 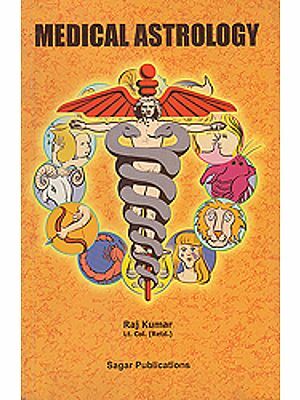 A treasure trove of ancient as well as modern wisdom about the subject, Medical Astrology will inspire and help you to lead a healthier life. A full time astrologer for over a decade Dr. Prem Kumar Sharma’s predictions have been chronicled in leading newspapers like Hindustan Times. The Indian Express the Times of India, The Tribune, Hind Samachar and Punjab Kesri. A familiar face on television, Dr. Sharma has regular Programmes on Star News Sahara Samay, Zee Jagran, PTC News Punjabi and PTC Chak Dr. he has received a number of awards for his contribution to the field of astrology, including the prestigious Best Vastu Consultant 2008 Gem of India, Rashtriya Rattan Award 2002 and the pride of India Award 2002 by the all India achievers conferences. He ahs a number of books on astrology gemology and Vastu to his credit. 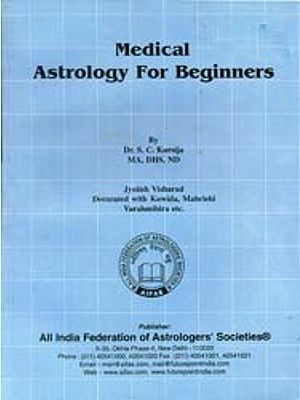 Since ancient times in India as well as in other parts of the world astrology has been used in the medical practice. In India the vaids or traditional medical doctors of the old school of Ayurveda used to cast a horoscope of the patient to analyze the causes of the diseases and to prescribe the cure. The seventeenth century herbalist Nicholas Culpeper once said, Only astrology are fit to study medicine and a medical man without astrology is like a lamp without oil. I am aware of the availability of many books on this subject both by Indian as well as foreign authors. Usually in these books the diseases and their astrological indications are described but rarely any book defines health and discusses the topic in detail. The dictionary defines health as the state of wellness in body and mind. This definition is a good attempt because it includes mind and we all realize sooner or later that our mind plays a crucial and decisive role in our feelings of wellness and cure of diseases. But we of the east due to our very rich spiritual background know that a very essential factor is still missing in the above definition of health. A human being is a product of three main parts viz, body, mind and soul. So to enjoy good health one needs to be aware of these three elements. As per astrology the physical body is represented by the ascendant of the birth chart the mind by the moon and the soul by the sun. Therefore we can conclude that the ascendant lord moon and sun in a chart decide broadly the health of a person. I believe that when there is imbalance of harmony among these three then disease sets in. above all the strength and auspiciousness of the sun in a chart is the greatest asset as far as physical health is concerned. The favorable ascendant lord and the sun gives self-confidence, self-reliance, recuperative powers and healing powers and all these are very essential for perfect sparkling health. Then follows the role of the mind for which an affliction free and strong Moon ensures a right mental balance in order to remain happy even in adverse conditions. A strong and balanced mind also helps you recover fast from illness. All my beliefs are based on my experiences and astrological predictions which have been proved correct time after time over the past decades. I have divided this book into three sections. The first which is Section-A, contagions nine chapters through which I have tried to give all the concepts and information about the subject of medical astrology. Then in Section-B which consists of eleven Chapters I have discussed diseases of the body and mind. The Section-C is about cure contains a chapter on the remedial measures. Now let us see in nutshell what this book is all about. I have started the first section with a chapter on Healthy living. In this chapter I have explained health through broader perspective which contains the physical emotional intellectual, spiritual, occupational and social aspects. The second chapter is about Longevity or in other words the life span of a person. The four main longevity categories are explained and astrological indications about these are described in this chapter. The next for chapters, viz Chap 3-6 describe the relevance of planets signs houses and constellations respectively as regard to the body parts and diseases which these represent. The seventh chapter explains the role and importance of the ascendant of a chart in the light of medical astrology. The sixth house in a chart is the main house which significance disease. An analysis of this house is described here. The last chapter of Section –A Locating Vulnerable body parts and will help you predict the body parts and possible ailments of these which the native may expect during the periods of the relevant planets. The Section-B contains eleven chapters – Head Diseases, Eye Diseases, Ear, Nose and throat (ENT) Diseases’, Nervous system Diseases, Chest Diseases, Abdomen Diseases, Reproductive System Diseases, Diseases of Legs and Feet, Cancer, Skin Diseases and Miscellaneous Diseases. The last section Section-C Contains a chapter in which remedial measures have been described in detail. Astrology is a science but it differs from other sciences in many ways and one such way is the interpretation of the astrological indications. Herein comes the role of an astrologer and his depth of knowledge. I have expressed my views here and I respect other’s views as well. I believe that nobody’s opinion is entirely worthless. Even a clock which is stopped and not working gives accurate time twice daily. I hope my humble effort brings happiness contentment and good health to all my sincere readers who have faith in me.